Is Steam closing the valve on Indies? A bug in Steam that made it so that smaller indie games would be harder to find has apparently been squashed, but algorithm changes going forward could still negatively impact smaller games on Valve's digital marketplace. According to developer Jake Birkett, sales for their games halved after a bug reportedly was introduced sometime in October. Several other devs discussed the issue in various forums, but Birkett's public blog post is what caught most people's attention. Birkett reported to the Indie Game Website that a Valve representative confirmed the bug has been fixed, but other parts of the changes to Valve's algorithm that contributed in less visibility to Birkett's games were intentional. According to Birkett the changes "helped some games, but hurt others." 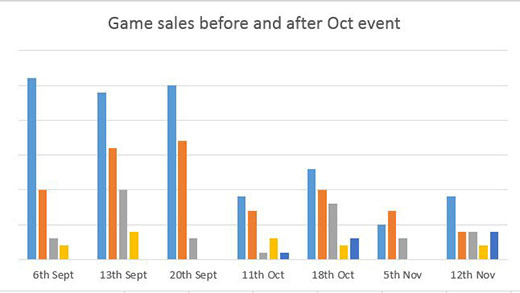 Birkett recorded the sales for his games in this chart. Developers are now worried that deliberate changes to Valve's visibility algorithm come at the expense of smaller indie games that rely on these tools to otherwise get the word out for their games without a large marketing budget. The new comes off the heels of another recent change at Steam, this one over revenue sharing. Games that sell over a certain threshold will surrender less of their revenue to Valve which mandates a 30-70 split for profits. Compare this to the recent news tha Epic's upcoming game store will only take 12 percent of the revenue from games sold. But indie developers say that Valve's changes almost exclusively benefit large developers and Triple-A games. With both of these news pieces, some indie devs are worried that Steam is no longer the best place for indie games going forward. "I'm worried about selling games on Steam in the future and will need to adapt in the coming year to other revenue sources," Birkett says. Tagged with Epic Games,	indie games,	News,	PC,	Steam,	Valve Software.